WASHINGTON ““ If you tell the rabbis, they will spread the word. That was the thinking behind two intimate White House meetings – the second of which took place on May 13 – with a carefully selected slate of 15 rabbis from across the country and representing the Orthodox, Reform, and Conservative streams. Jack Moline, a Conservative rabbi at Cong. 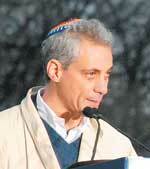 Agudas Achim in Alexandria, Va., initiated the meetings after a talk he had with his friend Rahm Emanuel, the White House chief of staff, about the Obama administration’s perceived lack of friendliness toward Israel. The two meetings, the first of which was held last month, were part of a “charm offensive” after relations between the Obama and Netanyahu governments hit a low in early March, when Israel announced a major building start in eastern Jerusalem during a visit to Israel by U.S. Vice President Joe Biden. The Obama administration wants Israel to freeze settlement in the west bank and building in the eastern part of Jerusalem, which Israel captured in the 1967 Six Day War and subsequently annexed. In recent weeks, several high-profile Jewish communal figures have slammed the Obama administration over the intensity and public nature of its criticisms of Israeli actions on these fronts. Some of the critics accused the White House of exerting much more pressure on Israel than the Palestinian Authority. Moline said the rabbis, all of whom attended both of the meetings, were selected because of the high profiles they have in their communities, and because they had concerns about how the Obama administration was conducting Middle East policy – but they had not displayed outright hostility to the president. “The rabbis who were in this group were chosen because they’re in touch with their different congregations in different parts of the country,” Moline said. Not all the rabbis came away entirely mollified, but nonetheless they were impressed by the seriousness of the outreach. Rabbi Efrem Goldberg of the Orthodox Boca Raton Synagogue in Florida said he left the meeting still wondering if the administration is on the right track, but still “cautiously optimistic” because of the depth of commitment to Israel he heard. “I left with a clear impression that these individuals have a real passion about Israel,” even if he did not agree with them on tactics, Goldberg said. Their interlocutors at the two meetings were high level: Dennis Ross, who runs Obama’s Iran policy; Dan Shapiro, the deputy national security adviser who supervises policy for Israel and its neighbors; Susan Sher, the chief White House liaison to the Jewish community; and Emanuel. Rabbi Stuart Weinblatt of B’nai Tzedek, a Conservative congregation in suburban Potomac, Md., said he felt it was especially incumbent upon the administration to explain its actions, given the misgivings about Obama that had circulated in the Jewish community prior to his election in a rumor campaign driven by e-mail that described him as anti-Israel and sympathetic to Muslims. The rabbis put questions to the group that ranged from the substantive to repetitions of rumors about the president and how he was perceived to have treated Israeli Prime Minister Benjamin Netanyahu poorly during a visit to Washington in March. The White House staffers answered the questions politely and with equanimity, Moline said. The officials emphasized, for instance, the closeness of the defense relationship. On May 13, as the rabbis were meeting with the staffers, for instance, the Obama administration authorized $205 million on top of the annual $3 billion in defense assistance for Israel to complete its Iron Dome short-range missile defense system. The administration officials “spent a considerable amount of time emphasizing that the United States is addressing Israel’s security concerns in a manner that [Israeli Defense Minister Ehud] Barak called better than at any previous time,” Moline reported. The rabbis in attendance – whose congregations ranged from Florida, the Midwest, Las Vegas, the Northeast, and the South – seemed receptive and took the message home. Rubinger seemed even more upbeat in an extensive interview with the Heritage Florida Jewish News after the second meeting. Now, Rubinger said, he was assuaged. “We are mending and moving beyond this controversy,” he said. Rubinger’s fellow Floridian Goldberg said his congregants needed to know more. Goldberg said some rabbis accepted the White House staffers’ argument that until recently they had not communicated their message effectively. Others, including Goldberg, thought that put too much weight on the message and not the substance of the policy. Weinblatt also pressed his interlocutors on the perceived imbalance in U.S. criticism of Israel. “In many respects, I think there was a recognition on their part that the mistakes had been made in regard to the way Israel had been singled out so strongly,” he said. Rubinger listed what he called “significant” administration talking points: The refusal to participate in the U.N.’s Durban Review Conference against racism last year in Geneva because the president believed Israel would be unfairly criticized; the rejection of Richard Goldstone’s U.N. report on Israel’s actions during last year’s war in Gaza, which pro-Israel advocates called inaccurate and biased; the refusal to participate in joint military exercises with Turkey when Ankara said it would withdraw if Israel were included; the ongoing cooperation between the United States and Israel on missile defense issues; and numerous recent visits to Washington by Barak, Israel’s defense minister.